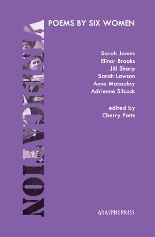 Vindication is a compelling collection of poems written by six women questioning their identity as daughters, mothers, lovers and individuals. Their personalities are trapped in prefabricated roles, or split and blurred in images that mirror unconvincing stereotypical figures of temptress or muse, at the margin of the main picture where man is at the centre. In these poems they vindicate their right to be people at the core of their own lives. what God to speak of. It is a peripheral subjugated position that marks her with sin and guilt, and leaves her isolated in a godless world. She is heroic in the childbirth, natural and supernatural at the same time, finally powerful and in control. Her heroism (or terrorism, who knows?) was triggered by anger and frustration which brought her to extreme reactions. The poem celebrates her bravery in a lucid and earnest tone showing honest recognition. Jill Sharp wittingly plays with lines, structures and relationships, revealing her sharp irony, apparently light-hearted but always hitting the target. She recreates the father she does not remember ‘from a photograph/of Harold Macmillan and an old raincoat’ (“Dada”) from a charity shop. A more up-to-date vision comes to her mind at the end of the poem, her dad ‘sits staring at his mobile phone, vapes / secretly in the downstairs toilet and / picks his nose when he’s stuck in traffic’. The ludic quality of her style is testified in the blank page of “The Emperor’s New Ode” where the lack of the written poem is replaced only by the footnotes that explain that ‘the only emperor is the emperor of ice cream: Wallace Stevens’. The sarcasm expressed in this absence underlines the futility and arrogance of men’s stories where woman’s ‘ontological significance has been underestimated’. The abusive relationship freezes the woman in an unredeemed position she cannot avoid. It seems a destiny she cannot escape but only endure. A swaggering swan is a sight to see. Was so strong, he invaded her private space. She avoided an attempted peck. Reached out and wrung his neck. The metamorphosis is reshaped, the story takes a different path; the swan-lover is erotically hand-cuffed and finally Leda has an active role. In this revelation she protects herself and vindicates her rights. The poem tells the actions to take rather than showing them in subtle imagery – as is done in other poems of this anthology – but it seems necessary at this point to set the issues that need to be addresses if women wish to change their condition. going to find a husband? You’ll need to learn to cook. A man once said to me, his best pupil, why study Maths? Why go to university? You will just get married and have children. looking straight at the eyes. A different approach has the prose poem “Here Lived” commemorating the Stolpersteine – meaning ‘stumbling stones’ –, a project started by the artist Gunter Demnig in memory of the victims of the Nazis’ persecution. The stones are set into the pavement in the place where the person lived or worked. They are covered by a brass plate engraved with the name and story of the victim. The passer-by can casually ‘stumble’ into it, metaphorically speaking, and remember what happened. It is a memorial that is not confined to a special sacred site but is dispersed everywhere the crime occurred against ‘Jews, Roma, Sinti, Jehovah’s Witnesses, homosexuals, disabled, dissidents’, whoever the Nazi regime considered a ‘potential issue’. The names of the ‘unwanted, the eliminated’ is polished, rubbed to shine ‘until they see their reflections … one stone, one name, one person’. The tone of the poem is strikingly sensible but at once conveys deep emotions. Its imagery focuses on the names and the stories, the importance of keeping their memory by making the plate gleam, reflecting our own stories in it. the first heavy drop of rain began to fall. The legacy to the forgotten stories of women of the past who endured the same sufferings is connected once again to the persecution of the unwanted in “Tying Laces”. The poem’s narrator practised hard to learn how to tie her shoe laces at the age of five and this simple action is ‘unfathomably entangled’ with the victims of the Hungarian Arrow Cross Militia who forced the people they executed to take off their shoes because ‘shoes, it seems,/were more valuable than life,’ (“Tying Laces”). The poems collected in the anthology form an absorbing analysis condensing some major issues in the vindication of women’s rights since Mary Wollstonecraft. They are a tribute commemorating women’s past sufferings and perseverance, and they point to present commitment to an ongoing fight.